I first became aware of Gabrielle Ray in the 1980s when my partner bought some Gabrielle Ray postcards to decorate the wall of her rooms. She bought them because they were decorative and attractive. I was fascinated by both Gabrielle Ray and the images themselves being a photographer. But I didn't think too much about it until a year or two later when we were rummaging in an antique store and I had the idea of looking through their postcard section to see if they had any more postcards like that. I didn't imagine that we would find more postcards of Gabrielle Ray - I was just looking for pictures of Edwardian actors/actresses. I was greatly surprised when I found several more Gabrielle Ray postcards and from then on resolved to see how many I could collect. This went on for some years and my collection rapidly grew. But by this time I was also becoming interested in who she was and tried to find out more about her. This proved an almost impossible task given the resources available to me. I didn't have time to travel to London and bigger libraries to research her. But the Internet was just emerging and I noticed how rapidly it was growing. So in 1996 I put up my first page about Gabrielle Ray with the idea it might result in more information coming to light. It worked! Day to day I am a photographer specialising in female portraiture and glamour with a particular interest in vintage styles. 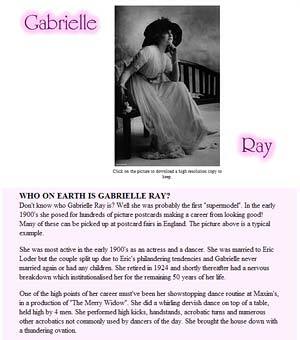 This of course makes the postcard legacy of Gabrielle Ray all the more fascinating to me. The first version of these pages went up in 1996 as part of the website www.hsq.co.uk (which no longer exists). At the time I'd noticed that the Internet was becoming very popular and I wondered if putting up a web page about Gabrielle Ray might get me some more information about her from people who knew more than I did. It worked and several people got in touch. From just being one page with very sketchy information it soon grew at least a little bit larger! In 1998 I started a website devoted to British Cinema entitled wickedlady.com (after the 1940s British film starring James Mason and Margaret Lockwood). Since web servers and domain names were much pricier in those days wickedlady.com shared it's space with the Gabrielle Ray pages and a few other websites. September 2009 and I have moved the Gabrielle Ray pages into their own domain and created this website devoted to her. Hopefully I can now expand the information easily in a design that facilitates this. In addition I have used a large legible font for the new design being mindful that many people interested in Gabrielle Ray are not young whippersnappers any more and need all the help they can get to see type clearly on screen! Some may have been wondering why all the fonts seem so large and why there is a black and white colour scheme - so now you know! I am still keen to talk to anyone who has more information about Gabrielle Ray - you can contact me here. Some portions of this website are copyright their respective owners. This is noted where appropriate. THIS IS A NON PROFIT EDUCATIONAL WEBSITE. If you see anything on the website which concerns you from a copyright or intellectual property perspective please contact us and we will address your concerns immediately. Reproduction of information from this website may only be done if a credit and link to the website is given. We cannot give permission for reproduction of elements of this website which are not our copyright. In this case it is your responsibility to get copyright clearance. If in doubt CONTACT US - Please also contact us if you do reproduce anything anywhere to let us know how the information has been used.